This book constitutes the refereed proceedings of the Third International Conference on Ad-Hoc Networks and Wireless, ADHOC-NOW 2004, held in Vancouver, Canada in July 2004. The 22 revised full papers and 8 revised short papers presented were carefully reviewed and selected from more than 150 submissions. 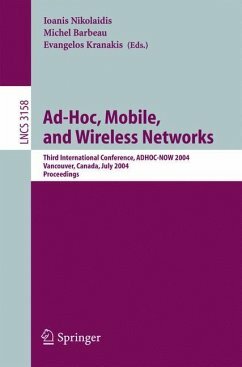 All current aspects of ad-hoc networking, sensor networks, mobile, wireless, and cooperating communication systems are addressed including, multicast, broadcast, performance, QoS, routing protocols, scalability, security, hybrid networks, self-organization, auto-configuration, energy consumption, peer-to-peer systems, and MAC protocols. The third international workshop on AD-HOC NetwOrks and Wireless was held in the downtown Vancouver facilities of Simon Fraser University. The ?rst ADHOC-NOW was held in 2002 at the Fields Institute in Toronto and the s- ond in 2003 in Montreal. Its purpose is to create a collaborative forum between Mathematicians,ComputerScientistsandEngineersforresearchintheemerging ?eld of ad-hoc networks. The number of submissions exceeded all expectations this year. Over 150 papers were submitted of which 22 regular and 8 short papers were accepted for presentation and inclusion in the conference proceedings. The program comm- teeconsistedofMichelBarbeau,StefanoBasagni,AzzedineBoukerche,Soumaya Cherkaoui, Leszek Gasieniec, Janelle Harms, Jeannette Janssen, Christos K- lamanis, Evangelos Kranakis, Danny Krizanc, Thomas Kunz, Ramiro Liscano, Lata Narayanan, Ioanis Nikolaidis, Stephan Olariu, Jaroslav Opatrny, Pino P- siano, Samuel Pierre, S.S. Ravi, Mazda Salmanian, Sunil Shende, Ladislav S- cho, Martha Steenstrup, Ivan Stojmenovic, Violet Syrotiuk, Ljiljana Trajkovic, Jorge Urrutia, Peter Widmayer, and Kui Wu. We would like to thank the invited speaker Martha Steenstrup for her - search presentation and the program committee for refereeing the submissions. Many thanks to Paul Boone, Jen Hall, Jo-Ann Rockwood, Zheyin Li, and Tao Wan for helping with the workshop logistics. Special thanks go to MITACS (MathematicsofInformationTechnologyandComplexSystems)andPIMS(- ci?c Institute for the Mathematical Sciences) for supporting the workshop ?n- cially,CarletonUniversityandtheUniversityofAlbertaforprovidingcomputing facilities, and Simon Fraser University for its hospitality. Contributed Papers.- Approximating the Minimum Number of Maximum Power Users in Ad Hoc Networks.- Multicast Versus Broadcast in a MANET.- Maximal Source Coverage Adaptive Gateway Discovery for Hybrid Ad Hoc Networks.- A Coverage-Preserving Density Control Algorithm for Wireless Sensor Networks.- Improved Approximation Algorithms for Connected Sensor Cover.- Energy-Memory-Security Tradeoffs in Distributed Sensor Networks.- Utilizing the Uncertainty of Intrusion Detection to Strengthen Security for Ad Hoc Networks.- Weathering the Storm: Managing Redundancy and Security in Ad Hoc Networks.- A Secure Autoconfiguration Protocol for MANET Nodes.- Analysis of the Information Propagation Time Among Mobile Hosts.- Consensus with Unknown Participants or Fundamental Self-Organization.- Connectivity of Wireless Sensor Networks with Constant Density.- Range-Free Ranking in Sensors Networks and Its Applications to Localization.- An Analytic Model Predicting the Optimal Range for Maximizing 1-Hop Broadcast Coverage in Dense Wireless Networks.- Experimental Comparison of Algorithms for Energy-Efficient Multicasting in Ad Hoc Networks.- Improving Distance Based Geographic Location Techniques in Sensor Networks.- A Fair Distributed Solution for Selfish Nodes Problem in Wireless Ad Hoc Networks.- Session-Based Service Discovery and Access Control in Peer-to-Peer Communications.- A Controlled Mobility Protocol for Topology Management of Ad Hoc Networks.- Efficient Data Collection Trees in Sensor Networks with Redundancy Removal.- Cross-Layer Optimization for High Density Sensor Networks: Distributed Passive Routing Decisions.- Adaptive Probing and Communication in Sensor Networks.- Progress Based Localized Power and Cost Aware Routing Algorithms for Ad Hoc and Sensor Wireless Networks.- Application of Eigenspace Analysis Techniques to Ad-Hoc Networks.- A Rate-Adaptive MAC Protocol for Low-Power Ultra-Wide Band Ad-Hoc Networks.- Lifetime-Extended, Power-Aware, Non-position Base Localized Routing in Hybrid Ad-Hoc/Infrastructure Network.- Short Contributed Papers.- Routing Table Dynamics in Mobile Ad-Hoc Networks: A Continuum Model.- Realistic Mobility for Mobile Ad Hoc Network Simulation.- On Timers of Routing Protocols in MANETs.- UAMAC: Unidirectional-Link Aware MAC Protocol for Heterogeneous Ad Hoc Networks.